Energy efficiency and climate change are rising on the government and industry agenda.The Logistics Emissions Accounting & Reduction Network ‘LEARN’ project aims to mobilize businesses to reduce their carbon footprint across their global logistics supply chains through improved carbon emissions calculation and reporting. 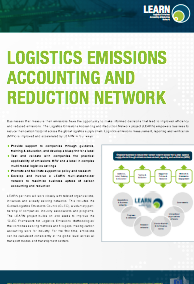 The project builds on and helps to improve the GLEC Framework for Logistics Emissions Methodologies as the universal method to consistently calculate an organisation's greenhouse gas (GHG) footprint across the global supply chain. The LEARN project is coordinated by Smart Freight Centre and its 13 consortium partners include the three industry associations representing shippers (ESC), freight forwarders (CLECAT) and IRU (carriers).